Finding the best plastic storage containers for food will help you to keep all sorts of food fresh longer. With food costs being at a full time high, wasting food simply isn’t a consideration for families. Choosing the right way to store dry goods, fresh produce and even leftovers is a great way to save money. So, here is a look at some of the best plastic food containers. The Rubbermaid food storage set is a nice solid set of storage containers that should meet most, if not all of your food storage needs, as this set has containers of various sizes. We do like the nesting lids and find that they are ideal for keeping these containers neat and tidy when not in use or when stored in the refrigerator. Some users may also find that they have little need for so many 1/2 cup containers unless they are packing lunch for family members or have toddlers and want to keep their snacks fresh when going out for the day. The 5 and 7 cup containers are perfect for taking food to parties, storing leftovers or when you are camping. We do find, though, that the set may be more useful if there were fewer small containers and at least one more of the larger containers. Lids nap to the bottom of the containers and to each other. BPA free, safe for use in the microwave, freezer and dishwasher. 5 containers of ½ cup size. The 5 1/2 cup containers can easily be used for organizational purposes such as storing small craft supplies, rubber bands, safety pins, children’s barrettes and the such. Tight Fitting Lids: People like the fact that the lids snap on tightly, making these products as good at storing liquids and sauces as they are for storing dry goods. Easy to Stack and Store Containers: They are easily stack on top of one another and they are also quite easy to store. When storing, the lids can be stored right with the containers so you don’t have to worry about a lid being displaced. Durable: They are extremely durable and known to hold up well over time. Little Big Box Food Plastic Container Set by Popit! The Little Big Box set of plastic storage containers consists of 8 containers of various sizes. They are ideal for storing snacks and leftovers. The 3 ounce containers are perfect for snacks while the 6 and 9 ounce containers for lunches. The larger containers are great for leftovers and carrying foods to get-togethers or when camping or traveling. 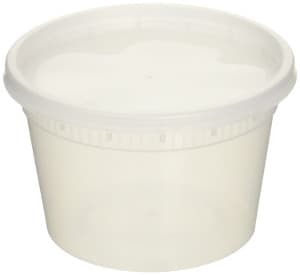 We really like both the size and the shape of these handy containers as well as the fact that the lids come attached to each container saving them from getting misplaced or lost. We do however feel that the hinges on the lid may not be strong enough for some uses, or when the hinge is repeatedly bent back too far. Sizes include: 3 ounces, 6 ounces, 9 ounces, 15 ounces, 28 ounces, 37 ounces and 47 ounces. These products come in handy when organizing your closet, bathroom shelves or kitchen cupboards. They can be used for storing items for the hair and even belts. Reviews for the Popit Little Big Box Set are very good with most users finding that this food saver set is ideal for storing all different types of foods. While few people got containers with weak hinges or tabs on the lids, they found that by contacting the Popit company, not only did they get replacements, but were even offered to refund the money. Keep food fresher: The lids are sealed tight enough to not only keep freshness in but unwanted odors out as well. Sturdy: The containers are exceptionally sturdy, making it possible to stack several containers one on top of another. Perfect for Lunches and Snacks: If you are carrying your own lunch or taking snacks on hiking trips, these products work perfectly. Rubbermaid products are considered to be some of the most well made and designed plastic containers on the market. 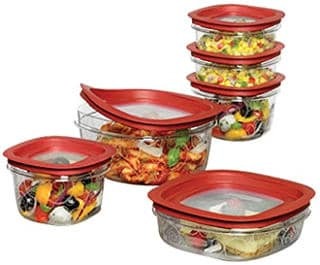 This Rubbermaid 12 piece set is perfect for smaller families who store small amounts of leftovers to be eaten later. The 1 ¼ cup containers are ideal for taking fruit, snacks, or other foods to school or for lunch. The low square container is perfect for sandwiches. The fact that the containers and lids nest together seems handy for saving space. The stain resistance will also keep these products looking better for long period. Made of Tritan plastic which resists stains. Set includes 3 cup and 5 cup containers and 2 each of 1 ¼ cup and 2 cup containers. These containers are the perfect size for organizing children’s bedrooms. Storing crayons, small game pieces and toys in larger containers keeps them safe from getting lost. Doesn’t Stain: Even if you store tomato sauces or beets in one of these containers, they won’t stain or discolor. Sturdy: They are sturdy and will stand up to long periods of use. Keeps Food Fresh: They keep food fresher due to the tight sealing lids. 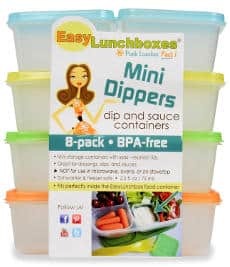 Designed to go with the “EasyLunchBox” system, these small containers are also perfect for packing those snacks for toddlers or when serving condiments for outdoor cookouts. While we find these small little storage containers very cute, we feel that their size may make them a bit limited for usage. However, as you will see from the comments of the users, people do find some good uses for them. Let’s have a look at their features now. Come in a set of 8. Kid friendly easy to open. Their small size makes them perfect for keeping homemade kids modeling compounds (like play dough) from drying out, or for making different colored frosting for decorating cookies at Christmas. Reviews for the EasyLunchboxes containers are quite good. Although a bit small, these products are perfect for some uses. Still, these aren’t the best containers for storing wetter foods as the lids do not fit tightly and can cause leaks. So, let’s see how people review them. Perfect for Toddler Snacks: Users do find that these small containers are perfect for snacks such as raisins or fish crackers for their toddlers. Sauces and Condiments: They are perfect for storing small amounts of sauces or condiments. The Reditainer Extreme Freeze Deli food containers are not only good for storing away helpings of frozen soups, sauces and even casseroles but they are also handy for storing refrigerated and dry foods. These cup like containers are great for those who want to carry casseroles or soups to work. They also work well for freezing and storing individual servings of foods. While the cups are reusable, they aren’t really what one should think of as a permanent storage container solution. At holiday time, they come in handy for filling with spiced nuts and even certain types of homemade candies to give as gifts to friends. However, if you are planning on storing leftovers in them, keep in mind that these cups aren’t really stackable, so if you use several at once they will take up a lot of space in your refrigerator or freezer. 24 package of 32 ounce deli containers. Can withstand temperatures to -40 degrees Fahrenheit. 5.55” tall X 4.55” diameter X 3.55” base. They are perfect for holding a large serving of lemonade or other cold drinks as well as for storing food. Try packing them with a bit of damp moss and using them for night crawlers, you will capture yourself when going fishing. Reviews for these deli cup containers are extraordinarily good with most users finding them extremely useful for all of their storage needs. Few users felt that they were flimsier than they had expected but most users found the opposite to be true. Seal Well: They are perfect for holding all types of soups and liquids since they seal well. Can Store Everything: People really like the fact that you can store just about anything in them and they are even great to use for carrying along that made at home iced tea or coffee. 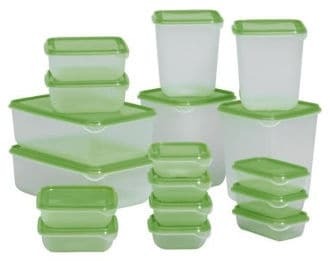 The Ikea BPA Free Food Container Set contains 17 containers in a nice variety of sizes. They also fit well into one another for storage. However, the lids do not nest together making them easy to become separated from the containers for which they are intended. While we like the wide variety of sizes for these containers, we don’t find them as well made as many other storage containers in this review. We also find that the lids can be somewhat difficult to seal. 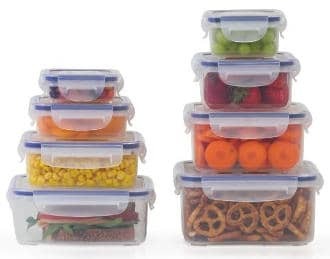 However, if you are looking for a cheap solution to storing leftovers, containers for carrying your lunch or organizing small objects around your house, these products are worth considering. Microwavable, freezer and dishwasher safe. With the wide variety of sizes and their more than reasonable price, they can be used to help organize items in your closet, laundry room and bathroom as well as for food. Reviews for the IkeaPruta Containers are above average. Some users feel that they are difficult to seal and say that despite stating that they are microwavable safe, they don’t hold well in the microwave. 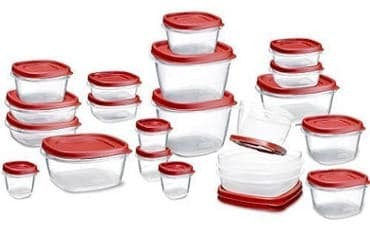 Nice Larger containers: Users like the fact that some of the containers are larger and perfect for storing family leftovers. Nice Size Assortment: There is a nice assortment of sizes, which makes all of the containers useful. Keeps Food Fresh: They do help to keep food fresh especially if you are using them to carry your lunches. All in all, plastic storage containers can help you keep your food fresh for longer as well as organize your refrigerator. So, choosing the best set of containers to meet different needs can make your food life better and your life a bit easier.